As a part of the University of North Texas and Texas Woman’s University dual degree program, UNT mechanical and energy engineering student and TWU math student, Stephanie Lopez, is earning two bachelor’s degrees from the two universities simultaneously. The dual degree program allows students to complete their TWU mathematics degree and choose between a biomedical, electrical, materials science or mechanical and energy engineering degree from UNT in four years with the recommended course of study. In May, Lopez will have a bachelor of science in mathematics from TWU and a bachelor of science in mechanical and energy engineering from UNT. The program was designed to encourage more women, like Lopez, to study engineering and grow professionally to attain leadership positions in the industry. Before learning about the dual degree program through a presentation given by professor and chair of the TWU Department of Mathematics and Computer Science, Don Edwards, Lopez didn’t know much about engineering careers. However, she was always interested in building and inventing so she decided to look into it. “I always liked math, but I didn’t want to just crunch numbers as a job. I wanted to design the actual structures,” Lopez said. After doing some research into engineering, she realized that it was something she could pursue. She decided the program would benefit her, because it allows her to explore her interests, but still uses her math strengths. She also believes that the program gives more career opportunities to students wanting to pursue math. “The program is nice because it might open up other TWU students to things that they are not considering so they won’t limit themselves,” Lopez said. Over the summer, Lopez interned at Naval Sea Systems Command, NAVSEA, headquartered in Washington, DC as an engineering technician where she worked alongside project engineer leads and learned large project management skills. The internship continues this winter but at the Carderock, Md. NAVSEA research facility. “This facility will expose me to more advanced engineering topics and experimental methods to test new class littoral combat ships and submarine models,” Lopez said. 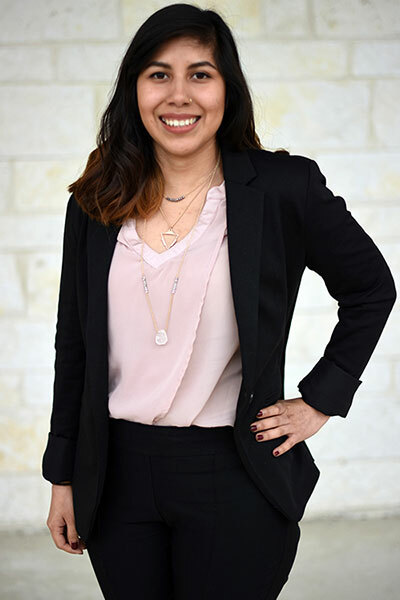 At UNT, Lopez is a student ambassador for the College of Engineering, where she gives tours to future students and their families, helps run outreach and engineering events and helps future students decide if UNT College of Engineering is the place for them. She also has been a part of the Robotics Club and the Society of Women Engineers. She plans to attend the SWE national conference in Minneapolis, Minn. this year to network and do on-the-spot interviews. At TWU, she was a member of Kappa Mu Epsilon, a math club, where they did math competitions, volunteer activities and games.